Kiteboarding at Pass-A-Grille Beach Florida - unusual settings needed - Nikon D300 Tamron 17-50mm @ f/2.8 ISO 800 1/500thPass-A-Grille Beach exists at the very southern end of all the gulf beaches of Pinellas County on Gulf Blvd. It is a quiet place, especially in February. It is a very quiet place in February just after a storm passes by. The length of the sandy beach was empty. 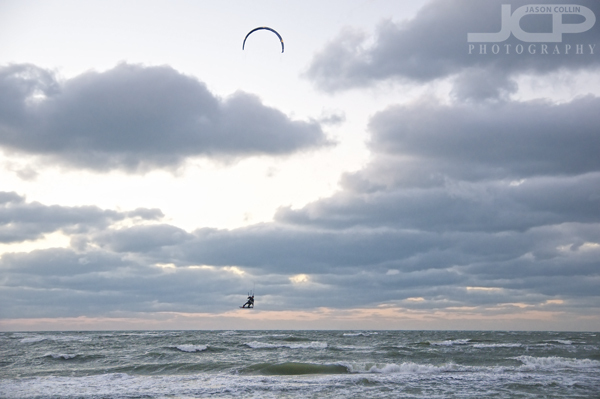 The only other human around was floating out above the water kiteboarding under stormy skies. Kiteboarder floating over Pass-A-Grille Beach Florida - Nikon D300 Tamron 17-50mm @ f/2.8 ISO 800 1/500thAs is usual when walking around with my DSLR, I had only one lens with me. I knew before I left the house the types of photographs I wanted to make, so I brought the appropriate lens for that job, my Tamron XR Di II 17-50mm f/2.8 lens. However, this meant when I saw the kiteboarder I could only make wide sweeping shots in which the kiteboarder himself appeared but as a speck. I felt limited by that then, but now I realize I would not have wanted to make the shots any other way because the story of these shots was largely in the storm itself. Showing the kiteboarder in the context of the weather was more dramatic than if I had made tight actions shots of him in flat light. 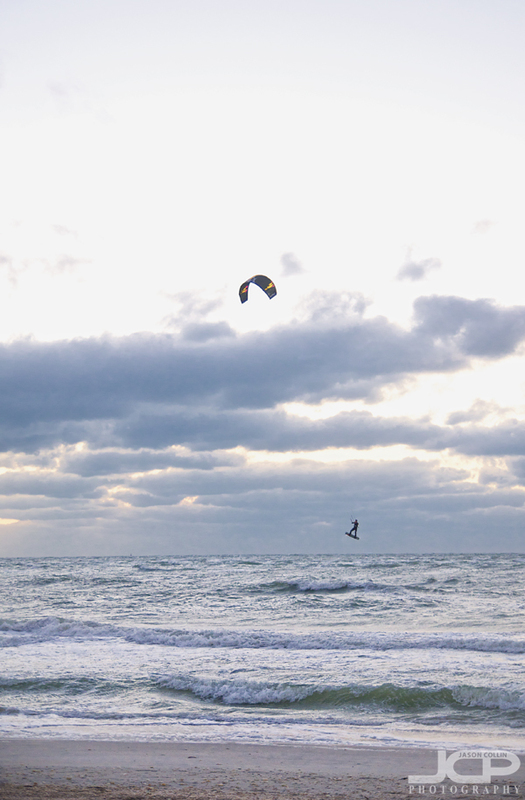 Kiteboarder zooming against the wind at Pass-A-Grille Beach FloridaIf you are looking for a quiet place to just "be," then I highly recommend Pass-A-Grille Beach for its forgottenness, it's end of the land feeling and for its sweeping views of the Gulf. If you go there in winter, after a storm, you might see someone with a dog and a camera passing you by.